Since its introduction in 1912, Life Savers Candies and Mints has become an iconic American brand across non-chocolate candy and mints, due to its great tasting flavors and unique candy-with-the-hole shape. Over 40 flavors of Life Savers have been created since the original Pep-O-Mint was launched. 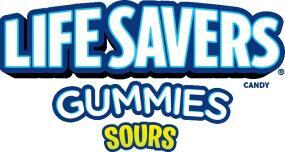 In recent years, the brand has expanded to include Life Savers Gummies. Be sure to visit our website at www.life-savers.com. Wrigley is a recognized leader in confections with a wide range of product offerings including gum, mints, hard and chewy candies, and lollipops. Wrigley’s world-famous brands – including Extra, Orbit, Doublemint, and five chewing gums, as well as confectionery brands Skittles, Starburst, Altoids, and Life Savers – create simple pleasures for consumers every day.